Kota the Triceratops from Hasbro Playskool is an animatronic ride-on dinosaur toy for kids 3 and up that interacts with your child. He moves his tail and horns when you touch him, bounces and makes stomping noises when you sit on him, and roars back when you roar at him! Kota the Triceratops comes with a leafy snack that he "chews" when you put it in his mouth. He has a soft plush fur that looks realistically scaly, and he's over 3 feet long and 2.5 feet tall. Kids up to 60 pounds can sit on Kota's back as he bounces up and down and makes stomping sounds as one of four adventurous songs plays. Kota the Triceratops is sold out at many stores and online retailers. 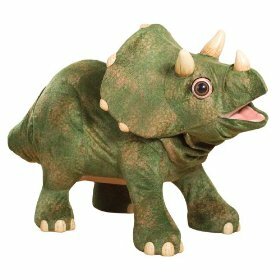 Check this page to find Kota the Triceratops toy in stock and to compare prices on Kota the Triceratops. Kota the Triceratops is perfectly sized for boys and girls as young as three to feel like they're riding on an oversized pet. The dinosaur toy stands in place as his legs make fun bouncing movements, and there is a secure handle for kids to hold that is hidden behind Kota's head. Sensors on the Kota the Triceratops's body sense your child's touch, and Kota responds with movement and sounds. Touch Kota's head, and he wiggles his horns. Put the included leaves in Kota's mouth, and he makes realistic chewing sounds and mouth movements. Touch Kota's nose, and he'll sniff your hand.